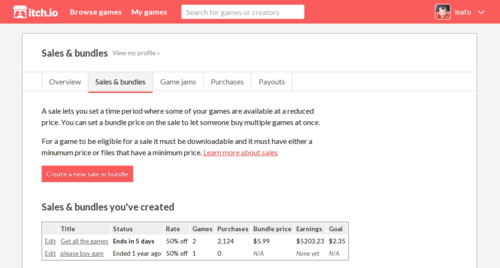 You’ll now find two new tabs from your My games page to help you manage game jams you’ve interacted with or and sales/bundles you’ve created. Both of these things were previous hidden away on the left column on the my games page, but now have their own dedicated pages with much more information. 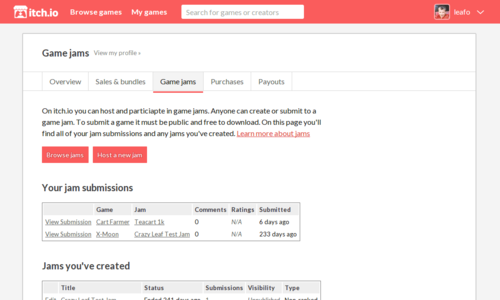 The new game jams tab helps you organize any games you’ve submitted to jams along with any game jams you’ve created. You can see at a glance all the important metrics. If you’ve been given edit permissions for a jam you didn’t directly create, you’ll find it here as well. The new sales & bundles tab gives you a listing of all the sales you’ve created along with data about how it’s progressing and any of its earnings.